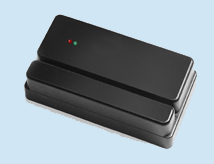 Combination Barcode and magnetic stripe reader for connection to controllers, PCs and networks. The Magbar J series is the first and only dual-reader, allowing the reading of barcodes and magnetic stripes in the same slot. These are decoded readers with internal decoding and therefore need no external devices for decoding. They can be used anywhere where the reading of both barcodes and magnetic stripes are required, such as in security systems, time & attendance systems, college campuses, taxi, and retail installations. These readers are available in a wide array of industry standard interfaces, are programmable, and are available with a variety of options, such as leds, alphanumeric displays, relays, and door sense inputs. The Magbar J will read all hi and lo-co magstripes, at any density. Perfect for use in Access Control and Time & Attendance applications.